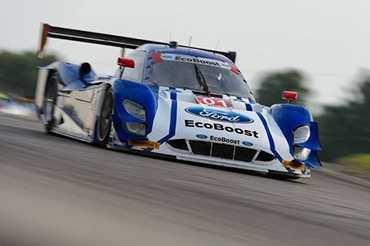 BOWMANVILLE, ON (July 13, 2015) – Chip Ganassi Racing with Felix Sabates (CGRFS) with drivers Scott Pruett and Joey Hand finished sixth in the Prototype class in the Mobil 1 SportsCar Grand Prix Presented by Hawk Performance at Canadian Tire Motorsports Park in Bowmanville, Ontario, Canada. Pruett started the No. 01 Ford EcoBoost Riley in the third position on the 2.459-mile road course. The first full-course caution came out shortly after the race started. Pruett was called to pit road for fuel just before the yellow flag waved 30 laps into the 128-lap race. However, IMSA ruled the No. 01 did not cross the line to pit lane before the pits were closed and were forced to serve a stop and 60-second penalty. The No. 01 was in the seventh position overall when Hand took over the wheel with just over an hour left in the 2-hour, 40-minute race. After cycling through pit stops, Hand was in the eighth position as he opened his first and only stint of the race. The No. 01 advanced to the sixth position before the checkered flag fell. The next TUDOR United SportsCar Championship race for CGRFS will be the Continental Tire Road Race Showcase in Elkhart Lake, WI at Road America on August 9. The No. 01 Ford EcoBoost prototype was forced to stop at the penalty box when IMSA ruled it did not cross the line to pit lane in time before a caution was called and pit lane was closed, just 30 laps into the 128-lap race.